Full HERA data set; cohort 1 and cohort 2. A total of 709 samples (65.6%) of the 1081 available samples passed quality control for adequate RNA concentrations. Included in these 709 samples there were replicates as well as control samples. There were unique gene information corresponding to 615 patients from the HERA trial. DFS indicates disease-free survival; FISH, fluorescence in situ hybridization; OS, overall survival. In all adusted Cox models, significant predictors were pathological tumor size, age, (or menopausal status), nodal status, and prior neoadjuvant chemotherapy. ER indicates estrogen receptor; FISH, fluorescence in situ hybridization; IHC, immunohistochemical analysis. aPatients with ER IHC information and FISH ratio of 2 or greater, and known nodal status. In the adjusted Cox model, nodal status is the only significant predictor. aPatients with available information on ESR1 and ERBB2 gene (cohort 2). eTable 1. Baseline characteristics between HERA Patients with ER IHC and HER2 information (Cohort1) and the Remainder of HERA patients. eTable 2. Summary of baseline characteristics between TransHERA patients with ESR1 and ERBB2 information (Cohort2) patients and the remainder of HERA patients. eFigure 1. FISH Ratio Distribution and Mean HER2 CN by ER IHC status. eFigure 4. Forest Plot of Disease-Free Survival and Overall Survival by Subgroups of ER IHC Status and Mean HER2 Copy Number. eFigure 5. Kaplan Meier Curves Showing Disease-Free Survival and Overall Survival by Treatment Arm for ESR1 Gene Expression Tertiles. Importance A number of studies suggest that response to antihuman epidermal growth factor receptor-2 (currently known as ERBB2, butreferred to asHER2 in this study) agents differs by estrogen receptor (ER) level status. The clinical relevance of this is unknown. Objective To determine the magnitude of trastuzumab benefit according to quantitative levels of ER and HER2 in the HERceptin Adjuvant (HERA) trial. Design, Setting, and Participants The HERA trial was an international, multicenter, randomized trial that included 5099 patients with early-stage HER2-positive breast cancer, randomized between 2001 and 2005 to receive either no trastuzumab or trastuzumab, after adjuvant chemotherapy. This is a secondary analysis of the HERA study. Local ER immunohistochemical (IHC) analyses, HER2 fluorescence in situ hybridization (FISH) ratio, and copy number results were available for 3037 patients (59.6%) randomized to observation and trastuzumab (1 or 2 years) (cohort 1). Transcript levels of ESR1 and HER2 genes were available for 615 patients (12.1%) (cohort 2). Interventions Patients were randomized to receive either no trastuzumab or 1 year vs 2 years of trastuzumab. Endocrine therapy was given to patients with hormone receptor–positive disease as per local guidelines. Main Outcomes and Measures Disease-free survival (DFS) and overall survival (OS) were the primary and secondary end points in the intent-to-treat population (ITT). Analyses adjusting for crossover (censored and inverse probability weighted [IPW]) were also performed. Interactions among treatment, ER status, and HER2 amplification using predefined cutoffs were assessed in Cox proportional hazards regression models. Results Median follow-up time was 8 years. Levels of FISH and HER2 copy numbers were significantly higher in ER-negative patients (P < .001). In cohort 1, for DFS and OS, a significant treatment effect was found for all ER, IHC, and FISH levels, except for the ER-positive/HER2 low FISH ratio (≥2 to <5) group (DFS: 3-way ITT Pvalue for interaction = .07; censored = .02; IPW = .03; OS ITT Pvalue for interaction = .007; censored = .04; IPW = .03). In cohort 2, consistent with cohort 1, a significant predictive effect of the ESR1 gene for both end points was also observed (DFS Pvalue for interaction = .06; OS = .02), indicating that breast cancers with higher ESR1 levels also derive less benefit from trastuzumab. Conclusions and Relevance Patients with HER2-positive breast cancers that are ER-positive by IHC analyses with low FISH ratio (≥2 to <5), or with higher ESR1 levels derive significantly less benefit from adjuvant trastuzumab after chemotherapy. These data may explain heterogeneity in response to anti-HER2 agents in HER2-positive, ER-positive breast cancers as some may be more luminal-like than HER2 driven. The use of trastuzumab, a monoclonal antibody targeted against the human epidermal growth factor receptor-2 (currently known as ERBB2, butreferred to asHER2 in this study) receptor, in addition to cytotoxic chemotherapy, has radically changed the natural history of breast cancers that overexpress the human epidermal growth factor-2 (HER2/neu or ERBB2) oncogene, resulting in considerable survival improvements. Despite concerted efforts to identify trastuzumab resistance mechanisms, the only biomarker currently validated to select patients for trastuzumab and other anti-HER2 therapy is still HER2 gene amplification and/or protein overexpression. An inverse correlation between levels of the estrogen receptor (ER) and HER2 has been previously noted1— patients with higher HER2 amplification have lower ER levels (both at the protein and messenger RNA [mRNA] level), which may explain their lower responses to hormonal agents. The biological reasons for this relationship are likely complex, but it suggests that interplay between ER and HER2 pathways could have an effect on the response to trastuzumab-based therapy.2,3 Despite this knowledge, the interaction between quantitative ER levels and trastuzumab benefit has not been extensively investigated in the large adjuvant trials. Recent data from neoadjuvant clinical trials4,5 report lower rates of pathological complete response in patients with ER-positive compared with ER-negative/HER2-positive tumors. These data support the hypothesis that estrogen signaling may influence response to anti-HER2 based therapies. In this study, we investigated the hypothesis that trastuzumab benefit would be lower in patients with HER2-positive tumors with a dominant estrogen signaling pathway. To this end, we evaluated trastuzumab benefit in subgroups defined by ER status and HER2 amplification (using copy number and fluorescence in situ hybridization [FISH] ratios) from patients enrolled in the HERceptin Adjuvant clinical trial (HERA), the largest randomized trial for adjuvant therapy with trastuzamab, to our knowledge.6 Because we also had gene expression levels of ESR1 and ERBB2 available from a subset of patients, we investigated if similar results could be observed using the corresponding transcript levels. Question Does the degree of HER2 amplification and estrogen receptor (ER) expression levels influence response to trastuzumab following adjuvant chemotherapy in patients with early-stage HER2-positive breast cancers? Findings Using 3037 patient samples from the HERA Trial, we found reduced trastuzumab benefit in ER-positive patients with low fluorescence in situ hybridization (FISH) ratios (≥2 to <5). Similarly, less trastuzumab benefit was observed in cases with highest ESR1 expression. Meaning A subgroup of patients with ER- and HER2-positive disease, with lower FISH ratios or highest ESR1 expression, derive less benefit from adjuvant trastuzumab. The HERA (Breast International Group [BIG] 01-01; NCT00045032) study was an international, intergroup, open-label, phase 3 randomized clinical trial enrolling 5102 women with HER2-positive (overexpressed defined as >10% + 3 staining by immunohistochemical analysis [IHC], or amplified defined as a FISH ratio of ≥2) primary breast cancer after a minimum of 4 courses of standard chemotherapy. These women were randomly assigned to 1 of 3 groups: observation (no trastuzumab), or 1 year or 2 years of adjuvant trastuzumab therapy administered intravenously every 3 weeks. The ethics committee and relevant health authorities at each participating site approved the study prior to start of recruitment. Patients gave written informed consent prior to enrollment in the study, and they were not compensated for their participation. There was also an optional consent to donate their breast tumor for future research purposes. The total number of tissue blocks collected from among the 5099 individual patients retrospectively (until December 2007) was 1229 (24%). The primary end point of the study is disease-free survival (DFS), defined as time from randomization to first occurrence of local, regional, distant recurrence, contralateral breast cancer including ductal carcinoma in situ, second nonbreast malignant disease, or death from any cause. The secondary end point is overall survival (OS), defined as the time from randomization to death from any cause. Patients were censored on the last day of follow-up if the corresponding event had not occurred. Recent follow-up data and efficacy data concerning 2-year vs 1-year adjuvant trastuzumab treatment have been reported and showed no superiority of 2 years vs 1 year.8 Therefore, in the present analysis, the 1- and 2-year trastuzumab arms are combined into a single arm. Of the 5099 eligible patients randomized, 3037 (59.6%) had locally tested ER IHC analysis, with positive defined as greater than 10% at that time, and HER2 FISH ratio and copy number available (cohort 1; Figure 1). Central confirmation of the tumors’ HER2 status was required in all cases prior to randomization but this did not necessarily require FISH analysis. Additional FISH analyses were performed retrospectively centrally for patients not having a FISH result.9 A ratio of 2.0 or greater was regarded as positive according to US Food and Drug Administration recommendations. We have previously defined groups using FISH ratio and HER2 copy number by using equal quartiles of the data.9 For the current analyses we used the same values (approximated to the closest median integer value) to define low and high groups, respectively: FISH ratio (low, ≥2 to <5 [hereafter FISH-low] vs high, ≥5 [hereafter FISH-high]); HER2 copy number (low, ≥4 to <10 [hereafter HER2-low] vs high, ≥10 [hereafter HER2-high]). A total of 709 of the 1081 available samples had quality RNA available for the gene expression analyses. Included in these 709 were replicates as well as control samples, resulting in 615 patients with gene expression data available for these analyses (cohort 2) (Figure 1). Sample RNA was extracted using the High Pure RNA Paraffin Kit (Roche), which is optimized for isolation of total RNA specifically from formalin-fixed and paraffin-embedded (FFPE) tissue samples. Two to 4 tissue sections of 4 μm were used for extraction of RNA for gene expression analyses. The concentration of the RNA was determined using a spectrophotometer (NanoDrop ND-1000). We used a DASL array (Illumina) to extract ESR1 and ERBB2 transcript levels from eligible samples. For this study, molecular profiling was performed on 100 ng of RNA using Illumina whole-genome complimentary DNA (cDNA)-mediated annealing, selection, extension, and ligation (WG-DASL) assay, specifically designed to capture mRNA expression levels from archived FFPE tissue samples. The WG-DASL method uses biotinylated random nonamer and oligo (dT) primers to convert input RNA to cDNA. The biotinylated cDNA is then immobilized to a streptavidin-coated solid support and annealed to a pool of gene-specific oligonucleotides (DAP) for extension and ligation followed by polymerase chain reaction (PCR) amplification with a biotinylated and a fluorophore-labeled universal primer. Finally, the single-stranded PCR products are eluted and hybridized to the IlluminaHT-12 (version 3) BeadChip. Each oligonucleotide probe is represented, on average, by 30 beads per hybridized sample. Control (liver and brain) RNA samples were included for each processed batch of 48 samples to ensure that RNA processing was successful and for quality control and normalization of data between assay batches. Illumina probe-gene annotations were programmatically mapped to the current HUGO gene annotation. When replicate samples were available for a single patient, the first annotated replicate was used to represent the sample. The hypotheses of interest were tested using information from the HERA database with clinical cutoff date of April 12, 2012, and a median follow-up time of 8 years. The main analysis was an ITT analysis (ie, selective crossover was not taken into account and all patients were analyzed based on the initial treatment assignment). To circumvent the selective crossover effect, a censored and an inverse probability weighted (IPW) analyses were performed.10 In the censored analysis, all observation patients who switched to trastuzumab were censored the first day they received active treatment. The IPW approach is based on the idea of artificially censoring the follow-up of each patient at the time of crossover.10,11 Then, the real treatment effect is assessed by recreating the population that would have been observed without crossover through statistical modeling and weights assignment. In this way, the follow-up of patients whose experience receiving the control treatment could not be observed because they selectively switched to trastuzumab, was replaced by the follow-up of patients with similar characteristics (both baseline and postrandomization factors) who remained in the control arm at the time of treatment switching. Fundamental to the IPW approach is the assumption of no unmeasured confounders, which implies that all common predictors have been appropriately measured and accounted for in the analysis.12 Even though this assumption cannot be tested based on the observed data, the availability of a sufficient number of covariates and the use of both baseline and time-dependent covariates that are common predictors of the outcome of interest and artificial censoring limits the risk of important omissions. Multivariate Cox proportional hazards regression models were used to model DFS and OS, and to obtain hazard ratios (HRs) along with corresponding 95% CIs. The terms of main interest were the 3-way interaction between treatment, ER local, and either FISH ratio or mean HER2 copy number, and the 3-way interaction between treatment, ESR1, and ERBB2 gene expression (both as continuous and categorical). The models were adjusted for various clinical-pathological factors (age, pathological tumor size, progesterone receptor local, ER local, tumor grade, menopausal status, nodal status, prior neoadjuvant chemotherapy, Eastern Cooperative Oncology Group [ECOG] performance status, race, and region). A backward elimination procedure (removal criterion 10%), was used to select the best model. Confirmatory stratified analyses were run when deviation from proportionality was identified by Schoenfeld residuals.14 Observed differences in hazard are depicted graphically via Kaplan-Meier curves, while interaction effects are displayed using forest plots. The median follow-up time was estimated using the reverse censoring method for OS. In the IPW analysis, the follow-up time of each patient was split into 1-month intervals and the cumulative time from May 16, 2005 (starting date for eligibility to crossover), to the end of the patient’s follow-up, if it occurred within that interval, or otherwise to the end of the interval, was used as a time-dependent covariate. Only patients eligible to crossover at that time interval were included in the weight calculation. No other time-varying covariates were available in the HERA trial. Estimation of weights was based on time-dependent Cox regression models with age at study entry and prior neoadjuvant chemotherapy included as time-fixed covariates. No other baseline characteristics were significantly associated with both the outcome (DFS or OS) and the probability of crossover. Weights were set equal to 1 for noneligible patients (no disease-free and with left ventricular ejection fraction <55%) and noneligible time intervals (ie, before May 16, 2005). Two different cohorts, subsets of the 5099 randomized, eligible, HERA patients at a median follow-up of 8 years (interquartile range [IQR], 7.1-8.3 years), were used in the analysis. The 1- and 2-year trastuzumab arms were combined.8 Cohort 1 comprised the 3037 patients with available local results on ER level and considered HER2-positive, were either FISH-low or HER2-low (observation group, 1008 cases; trastuzumab group, 2029 cases), while cohort 2 comprised 615 patients with gene expression data on ESR1 and ERBB2 (observation group, 201 cases; trastuzumab group, 414 cases) (Figure 1). Both cohorts had a median follow-up of 8 years and DFS and OS similar to the full HERA cohort when comparing patients by assigned treatment. This is reflected in the similar HRs estimated for each of these cohorts (Figure 1). For both cohorts, the trastuzumab benefit for both DFS and OS is similar to the benefit found in the HERA trial. 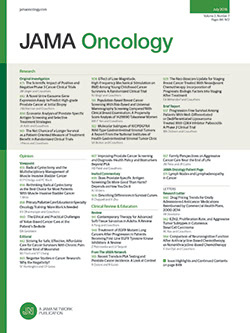 Differences were noted in tumor size, region, and patient race (see eTables 1 and 2 in the Supplement) indicating bigger participation in tissue provision in certain parts of the world, while ER-positive status was more prevalent among patients in cohort 1 (P < .001). Other baseline characteristics were similar among those with and without HER2 FISH central review, as well as those with and without gene expression data. A similar proportion of patients in the observation group selectively crossed over in the full HERA cohort (884 patients [52%]) and in cohort 1 (542 patients [54%]), whereas a higher proportion crossed over in cohort 2 (129 patients [64%]). In cohort 1, the distributions of FISH and HER2 copy number, according to ER-positive or ER-negative status, are shown in eFigure 1 in the Supplement. Significantly higher levels of HER2 amplification were detected in patients with ER-negative tumors (ER-negative vs ER-positive: FISH-high: 1030 of 1560 [66.0%] vs 791 of 1458 [54.3%]; P < .001). In cohort 2, significant correlations were detected between ESR1 and ER IHC and ERBB2 and either FISH or HER2 copy number (P < .001). Distributions of ESR1 and ERBB2 genes did not differ significantly by treatment. As expected, a significant moderate inverse correlation was detected between ERBB2 and ESR1 expression (Spearman ρ = −0.261; P < .001). The effect of the combined levels of HER2 amplification and ER status, or ERBB2 and ESR1 genes, on DFS and OS, is explored through Cox proportional hazards models by examining the significance of the corresponding 3-way interaction. In cohort 1, based on the ITT analysis, differential treatment effect by subgroup on DFS was not statistically significant (Pvalue for interaction = .07) (Figure 2). The trastuzumab benefit was apparent in all subgroups, although it was not significant for the patients who are ER -positive/FISH-low (HR, 0.92; adjusted [AHR], 0.89; 95% CI, 0.65-1.21) (eFigure 2 in the Supplement). However, using a censored analysis to account for crossover, a statistically significant 3-way interaction was found (P value for interaction= .02, Figure 2). Similarly, inference remains the same with the IPW results (P value for interaction = .03). This remained significant in Cox models adjusted for pathological tumor size, age (or menopausal status), nodal status, and prior neoadjuvant chemotherapy. Regarding OS, based on the ITT analysis, the effect of trastuzumab was found to be significantly different between the 4 subgroups created by the combination of FISH-low vs FISH-high and ER-negative vs ER-positive (P value for interaction = .006, Figure 3). In particular, significant benefit from trastuzumab was observed for the ER-positive/FISH-high patients (HR, 0.51; AHR, 0.48; 95% CI, 0.34-0.69; P < .001), with less pronounced benefit for the ER-negative categories, and no benefit for the ER-positive/FISH-low patients (HR, 1.34; AHR, 1.27; 95% CI, 0.81-2.01; P = .30) (eFigure 3 in the Supplement). When adjusting for crossover either through the censored or the IPW analysis, a significant 3-way interaction for OS was also found (P value for interaction = .04 and .03, respectively), similar to the DFS result, with a significant treatment benefit for all subgroups except for the ER-positive/FISH-low patients (Figure 3). Interestingly, for both for DFS and OS, the interaction between treatment and the combination of ER IHC analysis with HER2 copy number was not significant (P value for interaction DFS, P = .73; OS, P = .01) (eFigure 4 in the Supplement). These results are confirmed by additional analyses (censored and IPW). In cohort 2, Cox models were used to explore whether the effect of trastuzumab on either DFS or OS differs by the combination of ESR1 gene and ERBB2 transcript values. The corresponding 3-way interaction term is found to be statistically nonsignificant for both end points. However, a significant 2-way interaction was observed between treatment and ESR1 gene (DFS-adjusted P value for interaction = .01; OS-adjusted P value for interaction = .005; Figure 4) (eFigure 5 in the Supplement). In addition, a statistically significant interaction between treatment and ERBB2 (continuous) was detected for OS for the simple model (P = .047). The significant findings for treatment by ESR1 gene (tertiles) interaction is confirmed by all additional analyses (IPW and censored), for both end points. Notably, 115 (57%) of the 202 patients classified as ER-positive/FISH-low were also categorized as ESR1-high (P < .001). Our findings support the increasing amount of genomic and clinical data reporting that HER2-overexpressing tumors have distinct molecular and clinical profiles according to ER status. Molecular subtype classification of breast cancer using gene expression classify most patients with ER positive/HER2-positive breast cancer as “luminal-B” type breast cancers rather than HER2-enriched, as they had high expression of luminal type genes such as GATA3, BCL2, ESR1, as well as ERBB2.18,19 Some preliminary data support this concept by suggesting that the “HER2-enriched” subtype, which is predominantly ER negative, can achieve higher responses to HER2-directed therapy.20 This is further reinforced by the Cancer Genome Atlas (TCGA) body of work, which suggests differences in DNA methylation, micro-RNA, and reverse-phase protein arrays between HER2-enriched and Luminal-B/HER2-positive subtypes.21 We believe that our data highlight this same subgroup, that is, HER2-positive breast cancer that has a more luminal-like than HER2-driven phenotype. As we have defined this group by ER IHC levels and HER2 FISH, rather than gene expression, it will be possible to validate this interaction using other adjuvant HER2-positive breast cancer studies. We report for the first time, to our knowledge, using data from the HERA trial, that a subgroup of patients with ER-positive disease (with lower FISH ratios or highest ESR1 expression) derive less magnitude of benefit from adjuvant trastuzumab after prior adjuvant chemotherapy. Our data emphasize that more research into the clinical relevance of how ER influences HER2 oncogenic signaling and outcomes to anti-HER2 therapy are warranted. Corresponding Author: Sherene Loi, MD, PhD, Associate Professor, Division of Research and Clinical Medicine, Peter MacCallum Cancer Centre, East Melbourne, Victoria 3002, Australia (sherene.loi@petermac.org). Published Online: April 21, 2016. doi:10.1001/jamaoncol.2016.0339. Author Contributions: Drs Dafni and VP had full access to all the data in this study and take responsibility for the accuracy of the data analysis. Drs Loi and Dafni take full responsibility for the integrity of the data presented in this study. Study concept and design: Loi, Dafni, Piccart, Michiels, Leyland-Jones. Drafting of the manuscript: Loi, Dafni, Karlis, Polydoropoulou, Dowsett, Michiels, Leyland-Jones. Critical revision of the manuscript for important intellectual content: Loi, Dafni, Young, Willis, Long, de Azambuja, Sotiriou, Viale, Rüschoff, Piccart, Dowsett, Michiels, Leyland-Jones. Statistical analysis: Loi, Dafni, Karlis, Polydoropoulou, Willis, Piccart, Michiels, Leyland-Jones. Administrative, technical, or material support: Young, Long, de Azambuja, Sotiriou, Rüschoff. Study supervision: Loi, Viale, Leyland-Jones. Conflict of Interest Disclosures: Dr Loi receives grant support outside this work from Roche-Genentech. Drs de Azambuja, Piccart, Dowsett, Rüschoff, and Leyland-Jones report consulting fees and grant support outside this work from Roche-Genentech. No other disclosures are reported. Funding/Support: The HERA study was funded and sponsored by Hoffman-La Roche. SL is supported by the National Health and Medical Council of Australia (NHMRC) and Cancer Council Victoria (CCV) John Colebatch Fellowship. MD is supported by the Royal Marsden NIHR Biomedical Research Centre. Role of the Funder/Sponsor: The sponsor had no role in the design and conduct of this study; collection, management, analysis, and interpretation of the data; preparation, review, or approval of the manuscript; and decision to submit the manuscript for publication. Additional Contributions: We thank the HERA and TransHERA Committees, Zoi Tsourti, PhD, an employee of Frontier Science Foundation in Hellas, Athens, Greece, for her help in the statistical analyses and generation of figures. Dr Tsourti was not compensated for this work. We are grateful to the women who participated in this landmark study; the Breast European Adjuvant Study Team (BrEAST) data center; the Frontier Science Team; the Breast International Group headquarters staff; the HERA and TransHERA Steering committee; the Pathology Lab at TARGOS, Kessel, Germany; the Instituto Europeo di Oncologia (IEO), Milan, Italy; and all the physicians who actively participated in the success of the HERA trial.